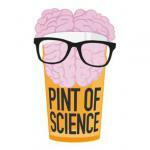 Pint of Science is a three day festival that takes place every May and brings researchers to your local pub, cafe or alternative social space to present their scientific discoveries. To join the mailing list for more information about the programme, venues and ticket sales, please visit the Pint of Science website. Coventry University and the University of Warwick are working together to bring a range of informal scientific, medical or social science talks to local venues over this three day festival. The talks are aimed at a lay audience, and will bring some interesting insights to the research that the two universities are doing, and how it impacts on our day to day lives. There will also be a chance to chat to the researchers and ask questions about what they do!